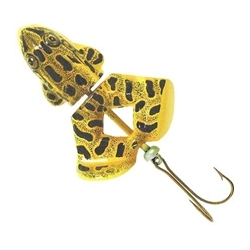 The Rebel Buzz'n Frog is a buzzbait in disguise, the only difference is that when you stop the retrive, the Buzz'n Frog floats head up just like a frog! It's free spinning rear legs churn the water's surface and it's semi-weedless rear hooks easily slip through heavy grass, weeds, and moss. It is 2-1/2" in size and 1/2oz in weight with 1/0 hooks.